The 463: Inside Tech : No You Can't. Yes We Can. No You Can't. Yes We Can. What has been the single most effective new media tool this campaign season? Twitters from campaigns? A YouTube gotcha ad? Facebook groups? Campaign theme-song ringtones? Google "bombs"? MySpace forums? Specially designed campaign social networks? Widget heavy Web sites? 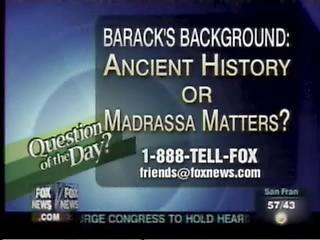 My suspicion is that it has been an old-fashioned email that lists outlandish and patently false charges which claim that Barack Obama is a Muslim, and much worse, insinuates that he is somehow a radical Islamic Manchurian Candidate. The power of this communication is that despite a decade of moronic chain emails that have universally been deemed false, there is still a large segment of American society that believes something just because they read it and it came from a friend. There is a reason why the "Bill Gates will pay you to forward this" email or the the email tax meme have lasted as long as they have. I have highly educated relatives who still earnestly send me this stuff. Somehow, the same folks who look over a $21 restaurant bill for five minutes have never gotten appropriately skeptical about Big Claims whizzing around the 'Net. They believe things first and ask questions never. After I did research on it, I was surprised that there hadn't been more written on the real impact of the email and wondered what the Obama strategy was to counter it. Of course, soon after when a Clinton county chair in Iowa was caught sending the email, more attention was paid to it. More recently, when the email was sent out to thousands on a military network, it raised official eyebrows and reprimands. But, apparently, the most significant front on chain mail turf battle has been with the Jewish community -- an obviously highly contested segment of the population in the primary. One Jewish pub said last week that "Obama staffers have struggled to contain the damage from numerous emails circulated among Jewish leaders that falsely claim Obama is a Muslim." "There has been a constant and virulent scare campaign via the Internet that has particularly targeted the Jewish community," he said, calling that focus "interesting." "It states that I’m a Muslim, that I was sworn into my Senate office on the Koran, and that I do not pledge allegiance. It is very important for everybody to know that it is fake. I never practiced Islam. I was raised by my secular mother. I have been a member of the Christian religion and an active Christian. I was sworn in with my hand on my family Bible and have said the Pledge of Allegiance since I was 3 years old." 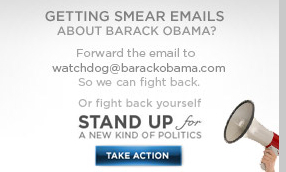 The Obama campaign also fought fire with fire and unleashed a January email, Web, you name it, campaign against the smears. Here's Sarah Lai Striland's Wired report on the response. And, here is the Obama campaign "fact page" with all flavors of third-party support. I have no idea if Obama will win. And, I suspect that if he did, I would have a good deal of trouble with many of his policies. However, you can't question how his method and approach to this campaign have rallied and excited millions of people who are sick and tired of the environment of hate, mistrust and polarization that allows a patently false and damaging email like the Obama-is-Muslim one to more than flourish. The irony is painful. People predicted that this would be the year of the "YouTube candidate" and inventive videos like the "We are the World"-esque pro-Obama one below (that is blowing up the Internet today) would have the predominate new media impact. It would be funny if it wasn't so sad that a chain-email that could be debunked with 30-seconds of research is the Internet's top contribution to the campaign thus far. I hate chain emails. I think its the older generation that fall for them because they always go straight to the trash. My folks on the other hand believed those anti-Obama emails at first. Kate it is a fun ride to take. elcspiaely ehen they take the beat throught the lock. going up and down.I know I enjoyed the ride. Kevin: After watching you eat all these years, know for sure that you would eat anyhnitg that doesn't crawl off your plate. Seems like Ken is having the harder time since he is even pickier that me. He picks beans out of chili but now will eat something that looks like it died on his plate and and is decomposing. YukI lost 31 pounds last July simply because the hospital food was SOOOOO bad I could not force it down, no way, it was realllly bad. Have gained about 8 pounds back but eat what I like now just not as much, and shoveling snow helps.But, whatever works. Just seems like its highly repititious and what are Lentils ? He will get tired of the same ol same ol and give it up.Look like some kind of beans to me but the boy is scuffing them right up.I shudder to think what he would have done with brussel sprouts when he wasMUCH younger. Obviously none of the 4H stuff has mayonaise on it. Not to mention the fact that what these clips (and otrehs like them) are trying to point out is that Republicans' most popular catchphrases don't even MEAN anything, and where they do have meaning, that meaning is intellectually insulting. But then, that makes my first point, doesn't it? They don't intend to appeal to people's intellect. I’m not sure what the big to do is about his winning the eclotien. Color does not make you a better president. Color does not help you stop war, greed, killing, starvation. People can do that. I don’t see how you can call it “Historical” because he got in, there just haven’t been to many black americans running, is the reason one didn’t get in sooner. Red, yellow, black, or white, all controlling governments are bad. They're the ones who ruined it for everyone since the beginning. They're the ones who introduced money, greed and death because of it. Ty for that? No matter what color you are. If we actually had a good government with really good people, we wouldn't need money, but we are so brain-washed we couldn't even fathom that.